I went straight to Umstead after work and met up with Lisa for a run on Company Mill. We need 2 more runs before the race on Sunday and today was one of those runs. Lisa pulled me for the first 2 miles and then I pulled her for the next 2 miles and then we both kept up a strong pace for the last 1.5 miles! We ended up doing 5.5 miles in exactly 1 hour- progress for both of us. It felt like a tempo effort. Now it's 10:30 pm and I can feel the DOMS setting in my legs due to the 150 wall balls from this morning. Foam rolling is due! Food: Breakfast was a leftover pancake from yesterday. Lunch was ground beef with cabbage and eggplant plus a fresh red bell pepper. Snacks were an orange, a banana, berries with Greek yogurt and 5 cashew clusters. 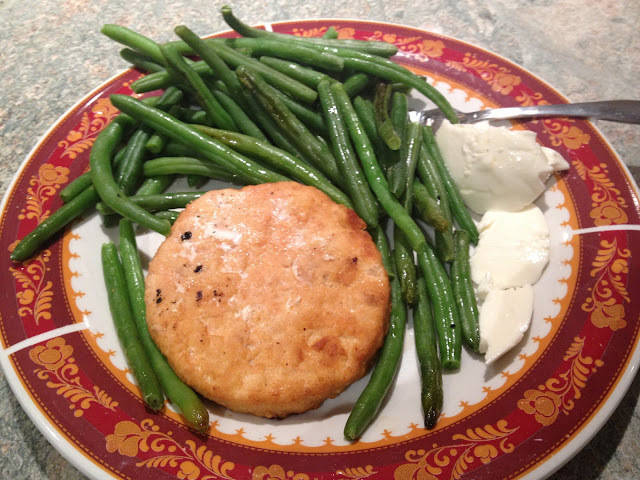 Dinner was a salmon burger with petit green beans and fresh mozzarella (see below) and dessert was a bowl of defrosted raspberries and marscapone cheese! Delicious. I'm getting hungry just reading about the food! !